October 5, 2011 — San Francisco, Calif. – Smith & Fong Co. today announced it has fully commercialized a soy-based, formaldehyde-free adhesive system in all its PlybooPure® bamboo flooring, PlybooSport® bamboo sport flooring lines as well as their full range of PlybooPure urea-formaldehyde-free bamboo plywood products. “We now have very healthy inventory on our SoyBond™ bamboo flooring and plywood products here in North America,” Smith & Fong president and founder Dan Smith said. “We’ve spent the better part of two years refining our manufacturing processes to adapt to the soy-based adhesives system developed by our partner Ashland, Inc. and based on their Soy adhesive Technology”. Smith & Fong’s Soybond bamboo flooring and bamboo plywood products all pass the California Section1350 testing and are eligible for LEED IEQc 4.3 and IEQc 4.4 respectively. Founded in 1989 and headquartered in San Francisco, Smith & Fong Co. was the first U.S. company to manufacture bamboo flooring for sale in North America, offering its initial product under the brand name Plyboo in 1993. 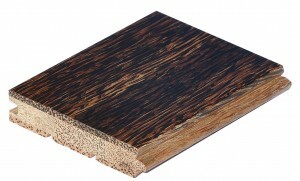 In 1996 the firm began producing bamboo plywood, followed by coconut palm flooring and plywood products in 2000. In 2009 the company introduced a domestically produced flooring line called Sideways that is FSC-certified, CARB-compliant and passes California Section 01350. Smith & Fong is committed to sustainability through innovation.